My teaching has come a long way when it comes to text features. But I realized recently another way I use text features myself: to help get a sense of the text structure. It was a pretty normal Monday, and I was tidying up my desk a bit. And what did I see peeking out from underneath a stack of book-order catalogs? Yep, the educational article I was supposed to have read before the staff meeting that began in... uh, three minutes. What did I do? Probably what many experienced readers would do. I quickly tried to grasp the overall structure of the article, to get a sense of the topics and how they were organized. How? I naturally gravitated to the text features. I started with the title and the subheadings, and then moved to the chart on the second page, and then the photo with a caption, and I even snuck in a bold word or two. (And a confession here: I also read the last paragraph, which wouldn't you know it, summarized the bulk of the article.) I gained a "big picture" concept of the article, and I was able to go to the meeting feeling, well, a little less unprepared. 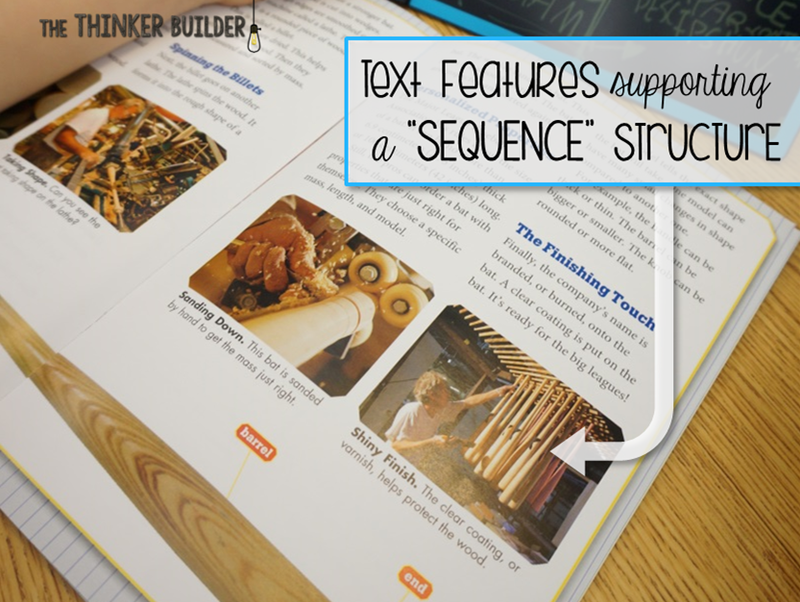 Later, I thought about how to work with my students to use text features with this new purpose in mind--to uncover the text structure (leaving out the stress of an upcoming meeting, of course). 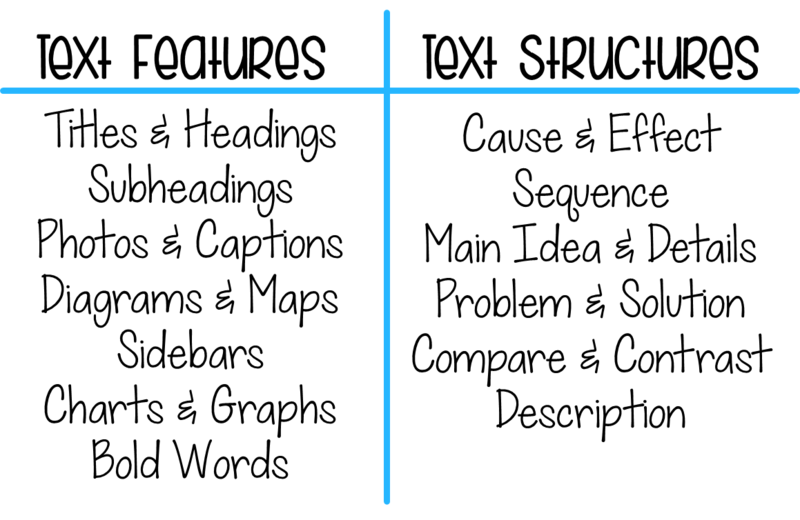 The structure is how the text is built, how it's organized. Wouldn't it be nice to have a sense of the structure before reading? If you are a bank robber, isn't it helpful to "case the joint" beforehand? I showed students the informational text they would be getting momentarily, but before handing it out, I very dramatically drew an arrow from the text features side of our chart over to the text structures side, as I said something like: "Let's try to use the text features we find in the article to help us understand the structure of the text, before we even start reading the article." I gave each student a copy of the text, which was mainly about how baseball bats are made. Students then began scanning the pages for text features and looking at them strategically. 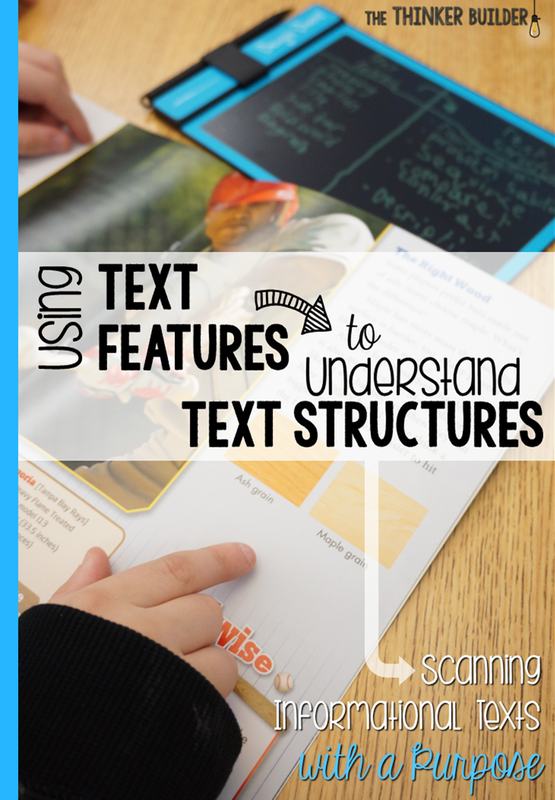 And this here was key: to make sure students realized they were using the text features NOT to learn information about a topic, but to gather clues about the text structure. One of the main text features in this particular article was a series of photographs that showed someone making a baseball bat. Each photo had an explanation of one step in the process. Students referred to their chart and concluded that a sequencing structure was likely for this section of the article. We checked if the sub-headings would also support a sequencing structure. Students thought the last subheading on the page, "The Finishing Touch," definitely aligned with their thinking. 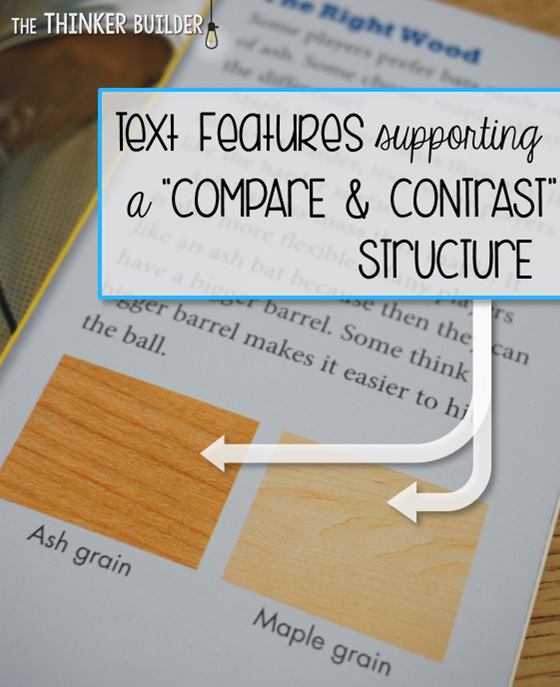 On the second page, students noticed a text feature showing the grain pattern of two types of wood. They inferred a compare & contrast structure made sense for this section of text. After taking this detailed walk through the text features, getting a sense of the sequencing structure in the first half of the article, and the compare & contrast structure in the second half, students went back and read the text fully. They could now layer the content of what they were reading onto the framework that we set-up. I wrapped up our lesson with the bank robber analogy. I actually compared what we did to when you go to the zoo or an amusement park, or even the mall, and you check-in with the large map kiosk, the one with the "You Are Here" arrow. Just like the text features did for us, it can help you get a sense of the layout, so you can better understand the content. Click image to download for free! 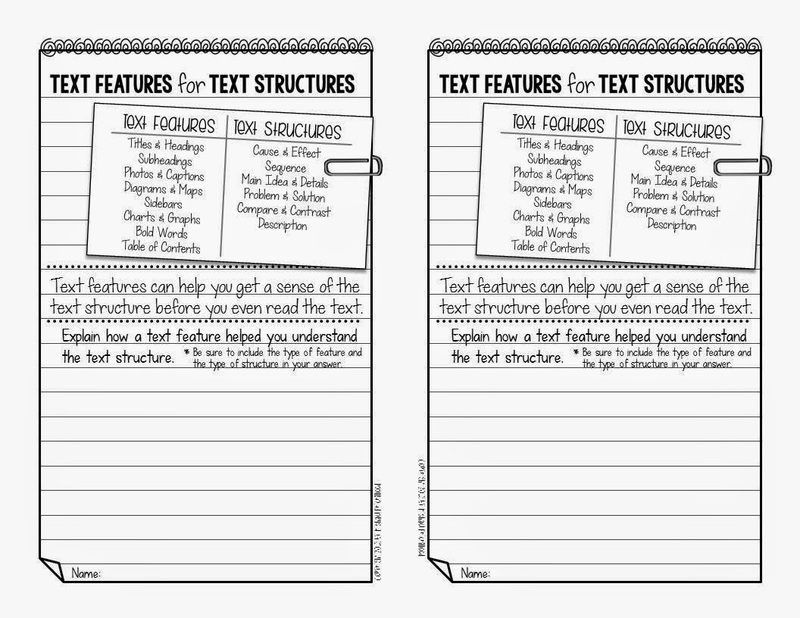 I created the half-size response sheet you see above to fit with this lesson, so you could have students record their thinking about using text features to help them understand text structures. It's free, so click on the image if you'd like to download it.